Dear Colleagues,I’m happy to introduce today, in the beginning of Inktober 2018, my new cool set. This set allows to reach the effects of drawing and writing with instruments filled by ink. I created it during two years long work on illustrative series for the dilogy book “Anisotropic Highway” and number of inner ink-like inner spread illustrations for “Analog” SF-magazine. 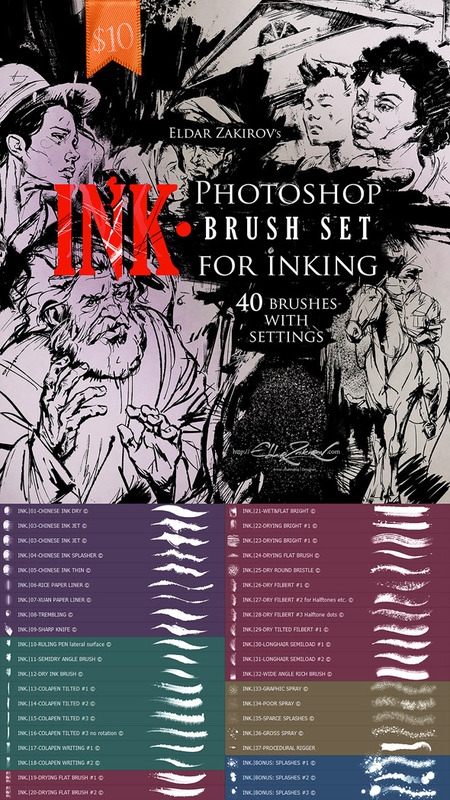 This Brush Set is designed for Adobe Photoshop but in fact it may be also used in Photoshop Elements. Working on those aforesaid graphic art pieces I was intended to reach the effect of drawing and writing by nib and ruling pen, various brushes, homemade pen (also known as cola pen). I sincerely hope that this product will be such useful for you, as useful it is for me while I use it working on my graphic or calligraphic arts. 2. ABR-file , “INK. wo procedural 37 ?.abr”, (in the “Fallback option for older PS versions” subfolder)The fallback for old Photoshop versions owners. 3. ATN-file , “DEHALFTONIZER, Hard INK Drawing.atn”,Action for preparing finished monochrome image for printing, removes halftones and leaves only full 100% black and pure white colors. 4. JPG-file , “LIST of INK. 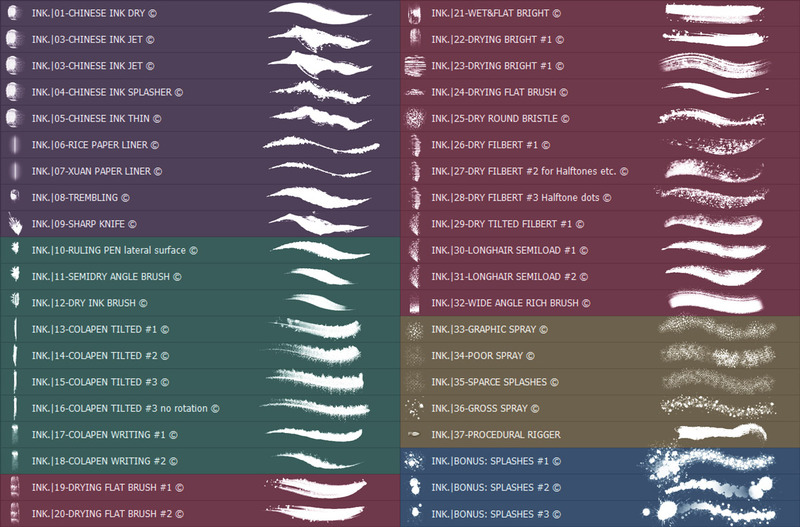 brush set by EldarZakirovNEW.jpg”,The list image of Set’s brushes with their titles and examples of their stroke/trail.It could be downloaded also from here (clickable). 5. PDF-file , “INK. Documentation, Manual & FAQs.pdf”,Description, documentation, general information, tips, FAQ.It could be downloaded also here (clickable).